Perfectly said!!!!! Amen!!!! Thank you. Just got off phone making an appointment to see my Doctor on Monday. I am feeling all kinds of emotions. Lonely, angry, anxious, tired, all part of my depression. I have felt to admit that I may need medication for this was a sign of weakness on my part. That if I prayed enough I would be better. You have helped me to see that God provides the Doctors and medication to help with this. Thank you so much for all your wisdom and honesty!!! God is good…all the time!!! YOU CONTINUE TO PRAY THAT THE DEVIL WILL NEVER DEFEAT YOU, YOU MA STUMBLE AND FALL GET RIGHT UP CONTINUE TO MOVE FOREWARD, WE IN RETURN WILL PRAY FOR YOU LORI. Thank you Holley – this brought me to tears. For years I thought EVERYONE dealt with depression. I didn’t know that my normal was not everyone’s normal. I thank the Lord for medications that are available and that have made a difference for me. I am just so grateful that Depression and Behavioral Health is okay to talk about now. No more shame! God bless your precious heart Miss Holley -just love you!!! Wonderful! Excellent ! I’ll adopt your words! Thankyou for sharing! I love how you don’t capitalize satan….this is something I intentionally do all the time! He doesn’t deserve a capital letter to head up his name! Love what you wrote as well! Beautiful, and so true in my life too. Thank you, Holley. Hallelujah and amen. I love you even more, Sister! Thank you so much for your words today. I’ve been struggling for years with depression, and would always think of myself as less than, and if people really knew me they wouldn’t like me at all. I have fibromyalgia and daily chronic pain which can exasperate my depression. The past few days have been especially hard, as I’m also taking care of my husband who has kidney failure. Beloved Lisa I believe you are a warrior and I pray God helps in every situation!!!! I pray for your husband God is the same yesterday… today and forever I pray he showers you with strength, courage, hope and a double portion of faith!!! Thank you Jesus for Ms. Holly for uplifting and sharing transparency!!!! You are loved Ms. Lisa and prayed for remember ….. one day at a time and praise God today IS A GOOD DAY !!!!!! Depression comes in so many forms. Holley, I love this piece. I admit to others that I had depression in the past and considered taking my life at one point. It’s not pretty but I worked through it and have thought of myself as a fighter. So warrior is also fitting in my opinion. The more we talk about things like this the more people will realize it can happen to anyone and that just because you dealt with it doesn’t mean you are weak. ring out in a broken world. Blessings to you. Thank you Holley and may God bless you abundantly!! I have been following you off and on for a number of years now and your insights have strengthened me in a number of ways. After years of struggling with abandonment and great responsibilities for which I was totally unprepared, I too have struggled with serious bouts of depression many times. Only my Faith and the knowledge that I am a child of God saved me from total despair. Throughout it all, I learned that depression is often the result of an attack of Satan who swoops in when I am at my weakest and attempts to take over my immortal soul. In no way do I discount the benefits of good medical care and I also learned that fighting the demon of depression required a two pronged attack. Medical help along with renewed reliance on God who gives me the spiritual strength and fortitude was the answer. The recurring attacks were often a result of my lack of attention to my spiritual health. Those experiences taught me the absolute necessity of maintaining my spiritual health and strength by staying close to the Lord via a strong prayer life. With the shield of a prayer “warrior”, I have been able to deflect the “hiss” of Satan when I first hear him coming. Thank you for putting words to the truth . Love you! You are indeed brave, Holley. I love your attitude and keep your notes like this for days when I need them. Thank you for encouraging others with your openness. You are an inspiration for all Holley. I thank God for directing me to your site. Thank you. I struggle with this too and as someone who serves in the church (we are the church, but you know what I mean)…the voice likes to tell extra lies on top of the already ugly ones. identity and your destiny. All of this is so good. " There is a strength in you, I see it ! " (William Wallace to the Princess in " Braveheart " ) Love you! I am so grateful to see words so powerful, Thank You!! Most often the enemy takes the form of fear when he attacks me, using such deriding remarks as: “Who do you think you are? You’re too old to be relevant! 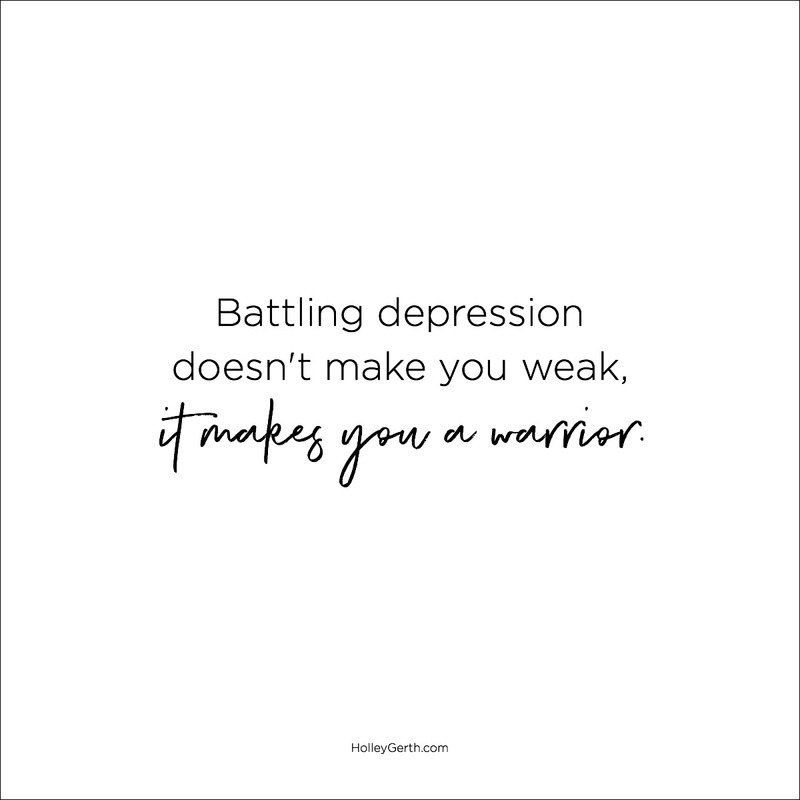 You don’t have what it takes to impact others for Jesus.” By changing the word “depression” to “fear,” this post spoke powerful truth and breathed fresh confidence into my spirit. No doubt others will see the truth of your statements for their own struggles also. Praise God for his inspiration through your tender, sensitive heart, Holley! Thank you. Yes indeed – GOD IS GREAT! GOD IS GOOD. AND GOD IS WITH YOU. I love this. I’ve been there. And you’re right. I am a much better pastor and encourager having walked through pain than before I experienced it. Dear Holly, Please look up these Japanese gold mended vessels. This is how God mends our brokenness. He makes us even more unique and even more beautiful than before. You are irrepeatable, invaluable and irresitably loved by Our Loving Abba! Shine On for Jesus! Thank you, Holly, for being so open and vulnerable, I never would have guessed. You’re always so encouraging and uplifting. May God bless you in His own special way as you continue to b)ess so many. Holley, Your post is an answer to my prayers. I am dealing with depression and anxiety right now. I’m trying to work through my writing with it, so your words give me hope. Also, I love the MORE THAN SMALL TALK podcast you are doing. It really is just the right thing I need at end of a tough day! All three of you are inspiring! Some great encouraging words here! I am a “fighting warrior” too! Beautiful words!!! My heroes are the ones who keeping rising each and every day in spite of mental health challenge. I have the privilege of walking alongside and they have taught me about a silent strenghth most never see. I struggle with fear and anxiety + insomnia and have for most of my life. It’s exhausting and discouraging but like, Holley, I refuse to give up or let it have me. Also like Holley I’ve done scary things over and over again in the face of that fear. There are folks that say that fear is a sin. Not so! It is what you do with that fear, how you respond to it that is the sin. Israel refused to go into Canaan at the Lord’s direction the first time around because they were afraid of the giants and THAT was sin. Going ahead with what God tells you to do despite knocking knees is true courage. We are all mighty warriors if we see ourselves as the Father sees us. Be encouraged, strong women of God! Thank you so much for your kind and encouraging words, fellow warriors! I’m so grateful we can fight this battle together.